Home Tags Posts tagged with "David Letterman"
Stephen Colbert has made his debut as CBS’ Late Show host, succeeding David Letterman who retired in May after 33 years. George Clooney and Republican White House contender Jeb Bush were among Stephen Colbert’s first guests. The former Colbert Report host opened the show with a sketch, singing the national anthem around the country. 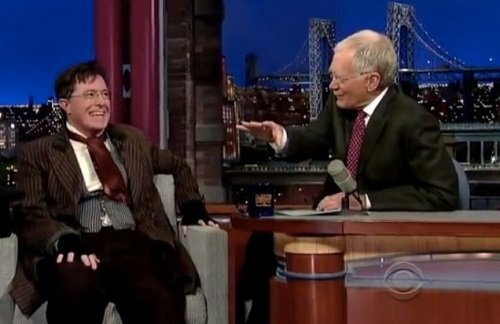 Stephen Colbert also paid tribute to his predecessor David Letterman, calling himself “a fan”. “We will try to honor his achievement by doing the best show we can and occasionally making the network very mad at us,” he said. “As long as I have nine months to make one hour of TV, I could do this forever,” Stephen Colbert added. The comedian played a hardline conservative in his previous show, Comedy Central’s satirical news show The Colbert Report, but he appeared as himself for his mainstream debut. He also binged on a bag of Oreo cookies as he made jokes about Donald Trump, who recently vowed never to eat Oreos again after makers Nabisco Inc said it was opening a new plant in Mexico. The broadcast ended with Stephen Colbert singing with his new house band, led by Jon Batiste, in a cover of Sly and the Family Stone’s Everyday People. They were joined by Mavis Staples, Aloe Blacc, Ben Folds and Buddy Guy, amongst others. 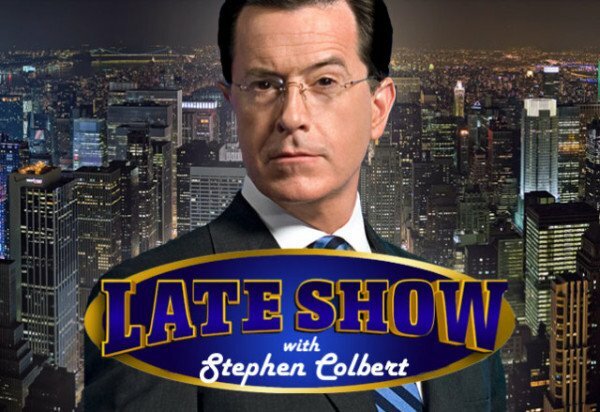 Comedy Central’s Stephen Colbert will succeed Late Show host David Letterman upon his retirement in 2015, CBS has said. Stephen Colbert, 49, is host of acclaimed late-night satire program The Colbert Report. David Letterman, 66, said last week he was retiring after 21 years hosting the CBS show and 11 years on NBC’s Late Night. On his show, Stephen Colbert plays a satirical version of himself to mock right-wing pundits. He has suggested he will retire the character for the new show. “Stephen Colbert is one of the most inventive and respected forces on television,” CBS president Leslie Moonves wrote in a statement following the announcement. Stephen Colbert’s biting brand of satire has drawn critical acclaim as well as provoking ire, often from the Republicans and conservatives he skewers. Recently he was attacked on social media for a joke some viewed as disparaging toward Asian Americans but which he meant as a satirical jab at the owner of the Washington Redskins American football team. Jay Leno told his guest Andy Cohen during Friday’s Tonight Show that the assumed beef between he and David Letterman is a tabloid creation. 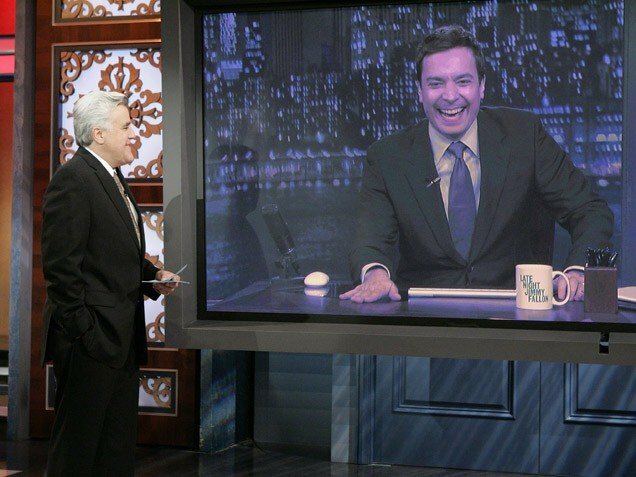 Jay Leno said the two spoke a month ago, talking about “things in TV and what was going on here” – presumably meaning Leno’s second Tonight Show exit. The candid conversation occurred when Andy Cohen turned the tables on Jay Leno, asking him to play “Plead the Fifth” from Cohen’s own talk show, Watch What Happens Live. Selena Gomez has finally revealed some details of her recent split from Justin Bieber. Selena Gomez, 20, tried to remain graceful and modest as she did an interview on the Late Show With David Letterman on Monday, however couldn’t help but made a slight jab at Justin Bieber. When David Letterman went on to explain that he got himself into a spot of trouble with Justin Bieber, Selena Gomez took the opportunity to bond over her own spat with him. The young actress has become quite the fashion darling of late as she promotes her new movie Spring Breakers, gracing the red-carpet in an array of chic ensembles.The former Disney star raised hemlines to show off her impressive pins in a very short sequin and lace black mini dress. Selena Gomez kept things chic by pairing the attire with a long tuxedo style jacket featuring leopard print lining and a pair of simple satin black stilettos. David Letterman has opened up about his indiscretions with female employees and how they rocked television – and his marriage – in a tell-all interview with Oprah Winfrey. 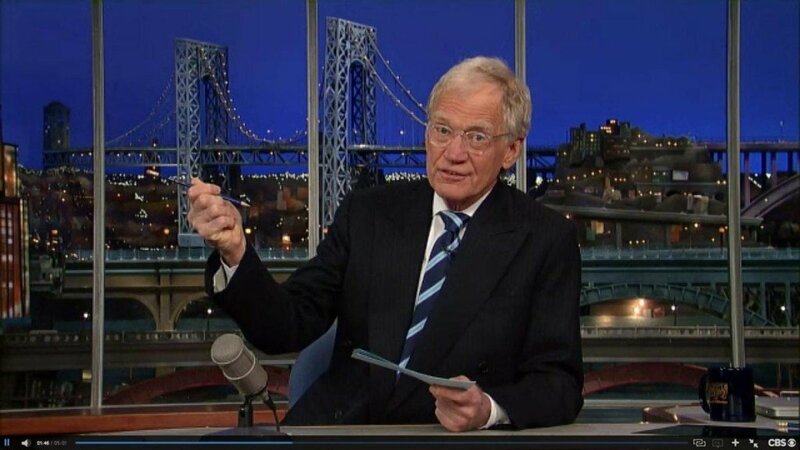 In October 2009, David Letterman made a shocking on-air revelation on the Late Show that he had cheated on his wife, Regina Lasko, whom he had only married that March. He made the confession after becoming the victim of an extortion plot concocted by a then-CBS producer, Robert Halderman, who demanded $2 million in exchange for his silence over the affairs. “I have no one to blame but myself,” David Letterman told Oprah Winfrey in the interview which will air on Sunday on the Oprah Winfrey Network (OWN). “And now, I feel better about myself, my relationship with my wife is never better, and it’s just because I want to be the person I always thought I was and probably was pretending I was. And so far, it’s been great. Things have been great. It emerged that he had cheated on Regina Lasko, with whom he has a 9-year-old son, with female staff members, allegedly including Late Show assistant Stephanie Birkitt. Robert Halderman, then a producer on CBS show 48 Hours, eventually served four months behind bars for the extortion plot. 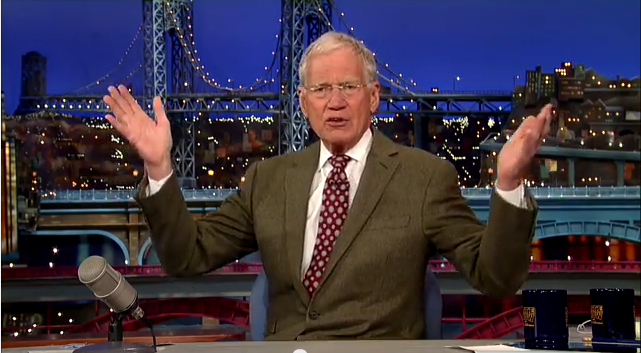 After David Letterman’s on-air confession, he publicly vowed to repair his marriage. “Let me tell you folks, I got my work cut out for me,” he said during the following taping. In the interview with Oprah Winfrey, David Letterman also attempted to put rumors about his years-long feud with fellow talk show great Jay Leno to bed. For decades, audiences have believed their spat began when David Letterman lost out on Johnny Carson’s old seat at the Tonight Show, yet in the interview he hinted at how his once close relationship with Jay Leno actually crumbled due to the comic’s insecurities. “We were always friends before all of this happened,” David Letterman, 65, said in the Oprah’s New Chapter interview, which airs in full on the OWN on January 6. “He has a way – he’s an unusual fellow. I’ve never met anyone quite like Jay. “And I will say – and I’m happy to say – that I think he is the funniest guy I’ve ever known. Just flat out, if you go to see him do his night club act, just the funniest, the smartest, a wonderful observationist and very appealing as a comic. The high-publicized feud has previously been blamed on David Letterman being passed over as the replacement for Johnny Carson in 1992, when Jay Leno was given the job instead. The battle was so well known that it was made into a 1996 HBO film, The Late Shift. And this year, the spat hotted up when Jay Leno ended his 17-year reign at the Tonight show to begin the Jay Leno Show for NBC – which failed to garner the ratings of his rival’s show. David Letterman went from strength to strength, overtaking Conan O’Brien in the late-night ratings. The rivals have managed to laugh at their mutual animosity, appearing in a commercial during the 2010 Super Bowl in which they were separated on a couch by Oprah Winfrey. To see the interview in its entirety, tune in to “Oprah’s Next Chapter” on January 6 at 9 p.m. ET on OWN. President Barack Obama and First Lady Michelle Obama were in fine form during Sunday night’s Kennedy Center Honors, laughing and holding hands at the event, which recognize the nation’s most culturally influential artists, performers, actors, and musicians. 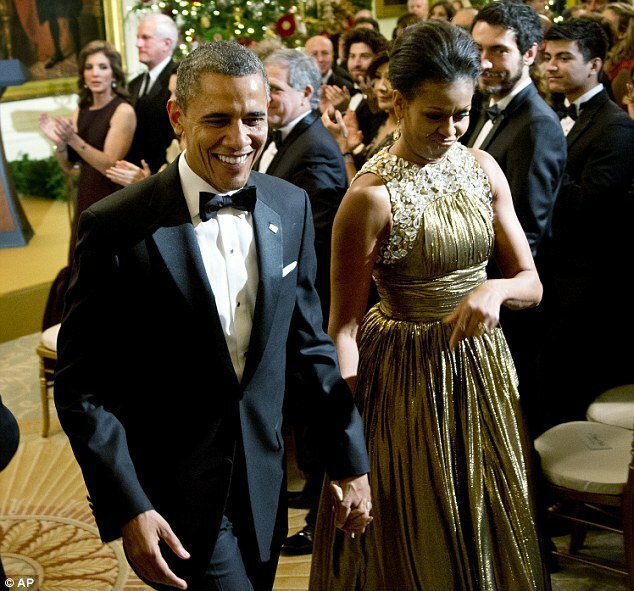 Wearing a stunning Michael Kors gold lamé dress embellished at the neckline, Michelle Obama dazzled as she entered the East Room of the White House with her husband, who was wearing a smartly-tailored tuxedo and an American flag on his lapel. Barack Obama honored seven of the country’s most influential artists, including Dustin Hoffman, Chicago bluesman Buddy Guy, late night host David Letterman, ballerina Natalia Markarova, and surviving members of rock band Led Zeppelin. The festivities later transitioned to the Kennedy Center, where fellow performers put on a show which will be broadcast later this month. 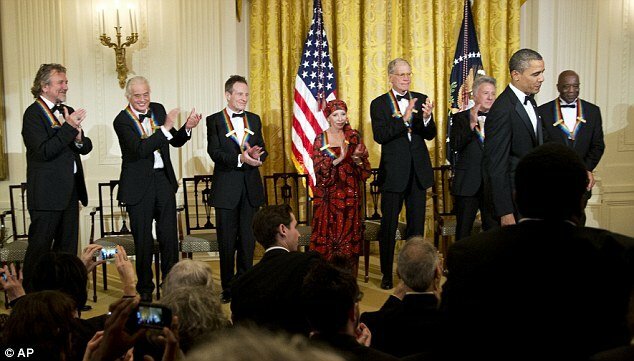 Stars from New York, Hollywood and the music world gathered Sunday in Washington to salute the honorees who were tonight receiving the nation’s highest award for artistically influential Americans. “Tonight, we continue a tradition here at the White House by honoring some extraordinary people who have no business being on the same stage together,” Barack Obama began, joking to the recipients. The president hailed the drive and vision of the honorees, noting that many, like blues musician Buddy Guy, grew up in conditions that didn’t foster creativity. Buddy Guy, for instance, was born into a family of Louisiana sharecroppers with no electricity or running water. He went on to pioneer the use of distortion and feedback with his electric guitar. “[Their] passion took each of them from humble beginnings to the pinnacle of their profession,” Barack Obama said, according to The Hill. Former president Bill Clinton also offered lavish praise to Buddy Guy. “Buddy Guy’s life is a miracle,” Bill Clinton said. Late-night host David Letterman was one of the seven honored in the annual awards ceremony. Stephen Colbert and Jimmy Kimmel joined in celebrating David Letterman’s influence on many other comedians. “I knew Johnny, and I loved Johnny. Johnny was beyond reproach,” Stephen Colbert said in a toast to David Letterman. “Dave was stupid. Dave was ours. Dave was like us. Stephen Colbert marveled at David Letterman receiving such an award after he “corrupted the minds of a generation”. Paul Shaffer, David Letterman’s longtime band leader, said he knew his boss was uncomfortable hearing such accolades, but that he knew Letterman was enjoying every second of it. Meryl Streep introduced the honorees Saturday during a formal dinner at the U.S. State Department and noted that David Letterman had surpassed his mentor, Johnny Carson, in sustaining the longest late-night television career for more than 30 years. To salute Led Zeppelin, big names from the rock world dressed in black tie for their music heroes as a string ensemble played the band’s hit song “Kashmir” and other tunes at the State Department. Foo Fighters singer Dave Grohl said he never took any music lessons when he was starting out because “my teachers were Led Zeppelin. … They were the most powerful thing in my life”. Lenny Kravitz said their influential music, at its zenith in the 1970s, became a lasting part of the culture of rock and roll. “It’s very difficult,” he said. Zeppelin front man Robert Plant said he was flattered and overwhelmed in receiving the American culture prize. He said he was glad to see his former band mates, John Paul Jones and Jimmy Page, using good table manners. The trio is scheduled to appear Monday on CBS’ Late Show with David Letterman. They are often asked if they’ll reunite. Robert Plant told The Associated Press he plans to continue traveling the world and wants to make new music along the way. “If anybody wants to write some new songs, I’m game to write songs,” he said. Dustin Hoffman was honored for charting his own path after taking a junior college class in acting that “nobody ever flunks”. Meryl Streep, a 2011 honoree, said Dustin Hoffman’s quest to become an actor required waiting tables and typing for the yellow pages by day. “He’d do anything if it meant at night he could find himself on the stage,” she said. Glenn Close toasted Dustin Hoffman for defining the character actor as leading man in such movies as The Graduate, Rain Man and Tootsie – and as an artist who insisted on setting the highest standards for himself. Secretary of State Hillary Rodham Clinton said the ballerina Natalia Makarova “risked everything to have the freedom to dance the way she wanted to dance” when she defected from the Soviet Union in 1970. Natalia Makarova quickly made her debut with the American Ballet Theatre and later was the first exiled artist to return to the Soviet Union before its fall to dance with the Kirov Ballet. Hillary Clinton also took special note of David Letterman, saying he must be wondering what he’s doing in a crowd of talented artists and musicians. “Dave and I have a history,” she said. The crowd of artists and entertainers gave Hillary Clinton a standing ovation as she hosted her final salute to the nation’s artists as secretary of State. Kennedy Center Chairman David Rubenstein gave her a subtle nudge to run for president in 2016, saying there’s another room at the State Department to name after a secretary who later becomes president. President Barack Obama has rebuked Republican candidate Mitt Romney, saying that anyone seeking to be president needs to work for all Americans. Barack Obama told chat show host David Letterman that Mitt Romney was wrong to describe 47% of Americans as “victims”. Earlier, Mitt Romney defended his remarks after secretly filmed video of a speech to donors became public. He told Fox News he knew those “dependent on government” would not vote for him in November’s election. Mitt Romney also decried the notion of government “redistribution”, calling it an “entirely foreign concept”. More leaked video emerged on Tuesday, showing Mitt Romney saying Palestinians do not want peace in the Middle East. The full video of the Florida fundraiser was also published by liberal investigative magazine Mother Jones. In Tuesday’s Fox interview, Mitt Romney stood by his comments about the 47% of Americans who do not pay income tax. He said they support President Barack Obama and would never vote for him. He said his statement was “about the campaign”. “I’m talking about a perspective of individuals who are not likely to support me,” he said. “Those that are dependent on government and those that think government’s job is to redistribute, I’m not going to get them,” Mitt Romney said. Mitt Romney says he expects Barack Obama to receive about half of the vote in the November election because of these voters. The real problem, he added, was that so many people were not eligible to pay income tax because they had fallen into poverty. Recent polls indicate that the election is likely to be a close contest, although an NBC News/Wall Street Journal poll released on Tuesday evening showed that Barack Obama’s approval rate has hit 50% for the first time since March. In addition, the poll put the president ahead of Mitt Romney by 5% among likely voters polled across the nation. The poll had a margin of error of 3.6%. 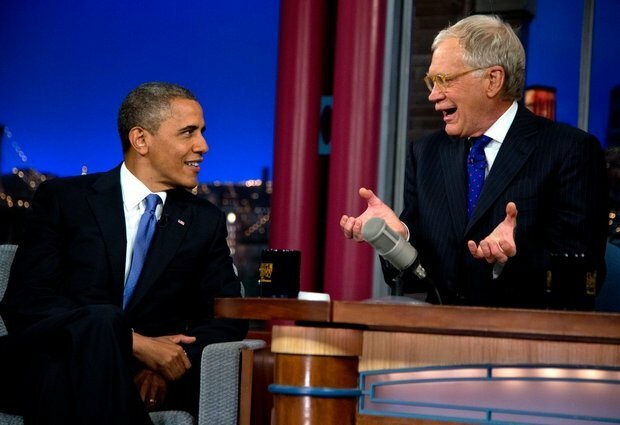 On David Letterman’s show, Barack Obama said he told the US on election night in 2008 he would work for everyone, including those who did not vote for them. “One thing I’ve learnt as president is you represent the entire country,” he said. “There are not a lot of people out there who think they are victims” or simply entitled to benefits, Barack Obama said. Barack Obama’s rebuke came at the end of a day in which more clips of Mitt Romney’s fundraising address emerged. In one, Mitt Romney said the Palestinians are “committed to Israel’s destruction”. “The Palestinians have no interest whatsoever in establishing peace,” he says in the video, adding that “the pathway to peace is almost unthinkable to accomplish”. But chief Palestinian negotiator Saeb Erekat told Reuters news agency that Mitt Romney was wrong to accuse the Palestinians of not seeking peace. “Only those who want to maintain the Israeli occupation will claim the Palestinians are not interested in peace,” he said. In another clip, the former Massachusetts governor is shown discussing Iran’s nuclear programme, and warning that America itself could come under attack. The first clips released on Monday showed the Republican candidate saying those who did not pay income tax would never vote for him. “There are 47% who are with him [Barack Obama], who are dependent upon government, who believe that they are victims, who believe the government has a responsibility to care for them, who believe that they are entitled to health care, to food, to housing, to you-name-it,” he said. The video clips provided to Mother Jones are said to have been filmed at a $50,000 per head fundraiser at some point after Mitt Romney became the presumptive Republican nominee. They were made public as the Romney campaign announced a new shift in strategy after several difficult days for the candidate. Campaign advisers told the US media on Monday that Mitt Romney would speak more specifically about his budget plans and tax policy. Nicolas Cage has denied he is a vampire after being pressed on a bizarre internet rumor by talk show king David Letterman on The Late Show. David Letterman produced a picture of Civil War-era Tennessee man from the 1860’s, which an eBay seller had claimed was proof Nicolas Cage is a member of the undead. The hilarious exchange started when David Letterman said he wanted to ask Nicolas Cage about “one of those things sweeping the internet”. He then pulled out the picture, explained its history and wanted to find out Nicolas Cage’s take on the theory. He also pointed out there was a fatal flaw in the reasoning of the enterprising salesman, which went against established lore about the creatures. Nicolas Cage has yet to play a creature of the night on the silver screen, though he did star as a yuppie who thought he was becoming a blood-sucker in 1989’s Vampire’s Kiss. He is not the only star to have been caught up in a row due to an old picture however. 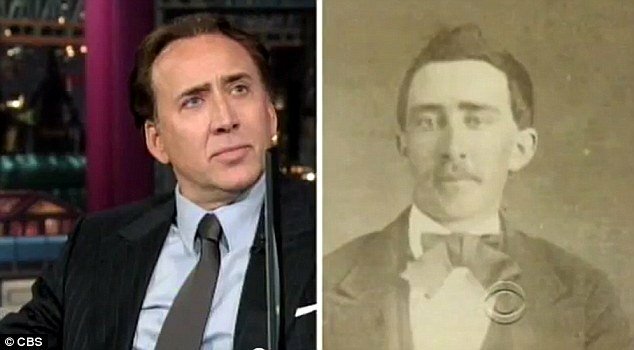 Weeks after “Nicolas Cage” photo appeared online, another photo from the same era popped up showing a man bearing a strong resemblance to John Travolta. This was used as proof of claims the Saturday Night Fever favorite was in fact a time traveler. To date Nicolas Cage, who is a scientologist, has yet to deny his ability to travel backward and forward through time. 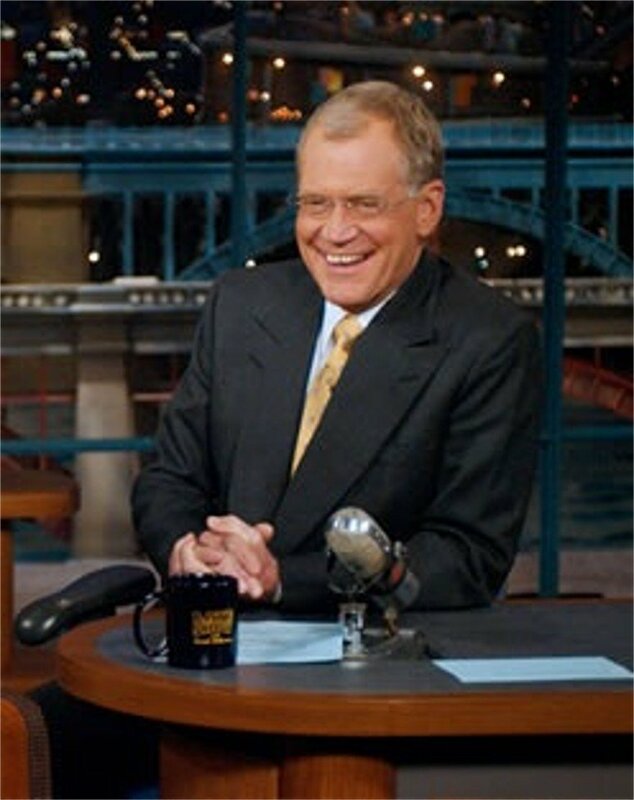 [googlead tip=”patrat_mediu” aliniat=”stanga”]A website forum, which is frequently utilized to spread Al-Qaeda’s dispatches, has posted a death threat against David Letterman. The jihadist website post, which was issued by frequent commenter on the forum, has threatened David Letterman, urging Muslim followers to “cut the tongue” of the Late Show host because of a joke the comic made on his CBS show. According to the SITE Intelligence Group, a private company for sites monitoring service, that tracks extremists websites online activity, the threat was posted Tuesday on the Shumuka al-Islam forum, a popular Internet destination for radical Muslims. [googlead tip=”vertical_mic”]Al-Basrawi also wrote that David Letterman had made reference to both Osama bin Laden and Kashmiri and said that Letterman had demonstrated on his neck how Kashmiri died. Sayyid Nosair al-Masri was tried for the murder of Rabbi Meir Kahane in 1990. According to Adam Raisman, SITE analyst, the Shumukh-al-Islam forum is a site where messages from Al Qaeda frequently first appear online in the United States. “It’s a clearing house for Al-Qaeda material. It gets the most Al-Qaeda supporters,” he said. Adam Raisman ranked the threat as more worrisome than the “warning” posted against South Park creators Trey Parker and Matt Stone last year. “This was a more explicit threat,” he said. “He showed his evil nature and deep hatred for Islam and Muslims, and said that Ilyas Kashmiri was killed and he joined bin Laden,” he wrote. The news was first reported by Stars and Stripes. There was no comment from CBS or Letterman.